Background: In order to cater to the changing business scenario, employment and education profiles of labor, newer occupations, and emerging occupational health challenges, it is time to improve the performance of occupational health professionals by adapting core professional competencies while drawing on global knowledge. Objective: To delineate the competencies required for medical graduates, medical postgraduates, and Masters in Public Health (MPH) graduates practicing occupational health in India. Materials and Methods: First, offline and online literature searches were carried out to enlist the core competencies for occupational health. A draft template was prepared for the identified competencies and stakeholders were asked to rank the listed competencies on a three-point scale stating "must," "desirable," and "not required" for each of the three categories of professionals, i.e., medical graduates, medical postgraduates, and MPH graduates. Results: Through the extensive literature search, 23 competencies were identified for occupational health practitioners. According to stakeholders, five competencies were a must, nine were desirable, and nine were not required by a medical graduate. Similarly for a medical postgraduate, except the ability to judge the ergonomic design of the workplace and working tools, which is considered desirable, all other competencies were considered a must while for an MPH graduate all the enlisted 23 competencies were considered a must by the stakeholders. Conclusion: The framework of occupational health competencies developed through this research can be used to strengthen the training of occupational health professionals in India. The concept of occupational health is older than the industrial revolution. However, even after three centuries it has not evolved to a great magnitude in many nations, more importantly in developing nations. Financial and industrial globalization is increasing substantially around the world where developing countries stand to gain significantly. This requires industries to have a healthy and productive workforce who are engaged in every aspect of their business to overcome and prosper in an increasingly global and competitive business environment. The maintenance of positive health at work and of a healthy work environment not only makes a major contribution to productivity and thus, to a country's gross national product but also to an individual worker's motivation and job satisfaction. Occupational health care aims to create a healthy and safe working environment and a functional working community, prevent work-related diseases and accidents, and promote working ability. In the Declaration on Occupational Health for All  governments are encouraged to develop national policies and programs, which ensure that occupational health services are available for all workers. Such policies and programs should also include the education and training of health care professionals in occupational health. In India, occupational health is practiced by three categories of professionals. The first is the medical graduate who pursues a 4.5-year medical graduation course designed by the Medical Council of India (MCI). The occupational health curriculum for medical graduates centers more on sensitization than developing skills. The second is the medical postgraduate who is a medical graduate pursuing Doctor in Medicine mainly in Community Medicine or Preventive and Social Medicine. Again, the content-driven teaching does not provide opportunities for skill or competency development as a part of this program. The third one is the Masters in Public Health (MPH) graduate in Environmental and Occupational Health; both medical and nonmedical background graduates can pursue this 2-year course from universities. There is a limitation for nonmedical science graduates pursuing this course, particularly in diagnosing and investigating the occupational diseases. The medical graduates and postgraduates, while practicing occupational health, do have the option of pursuing additional courses on occupational health. At present in India, there are 21 institutes  that offer courses in the field of occupational health. With the exception of the All India Institute of Hygiene and Public Health, Kolkata, West Bengal, India, all other institutes have been established after 1950. Government as well as private institutes are involved in the teaching and training of occupational health-related disciplines. In India, the courses offered in occupational health include a 3-month certificate course known as Associate Fellow in Industrial Health, a 2-year diploma course in Industrial Health, and a 2-year Master's program in Environmental and Occupational Health. Most of these courses adopted a content-driven curriculum and have not spelt out the occupational health competencies that the graduates of these programs will acquire at the end of course. With this background, the present study was carried out to delineate the competencies required for medical graduates, medical postgraduates, and MPH graduates practicing occupational health in India. The first step comprised procuring the information through offline and online literature searches to enlist the core competencies for occupational health. Internet search was conducted utilizing the Google and PubMed search engines. A set of key words encompassing various domains related to occupational health or industrial health in India was used. The key words included "occupational health training," "occupational health courses," "occupational health courses in India," occupational health competencies," and "competency-driven medical education." The websites of the World Health Organization, International Labour Organization, Indian Association of Occupational Health, International Commission on Occupational Health, National Institute for Occupational Safety and Health (NIOSH), and Occupational Safety and Health Administration (OSHA) were also searched for procuring information on the competencies required for occupational health professionals. In addition, information was sought from the MCI, which is the professional council for regulating medical education and prescribing the curriculum for medical graduates and postgraduates in India. A detailed literature search of indexed and non-indexed journals in the field of occupational health of last two decades was also carried out to identify competencies for occupational health. ,, Through this strategy, 23 core competencies for the occupational health were identified. A draft template was prepared for the identified competencies and was circulated among the stakeholders. The stakeholders were asked to rank the listed competencies on three-point scale stating "must," "desirable," and "not required" for each of the three categories of professionals, i.e., medical graduates, medical postgraduates, and MPH graduates. Out of the 50 stakeholders to whom the template was sent electronically and through mail, only 34 stakeholders including public health specialists, past and present students of environmental and occupational health, occupational health researchers, and occupational health physicians responded and were thus, included in the study. Their ranking about the enlisted competencies was recorded. Finally, on the basis of responses of the study participants and the information available from the literature related to occupational health competencies, a final set of competencies for the different categories of occupational health professionals was delineated. 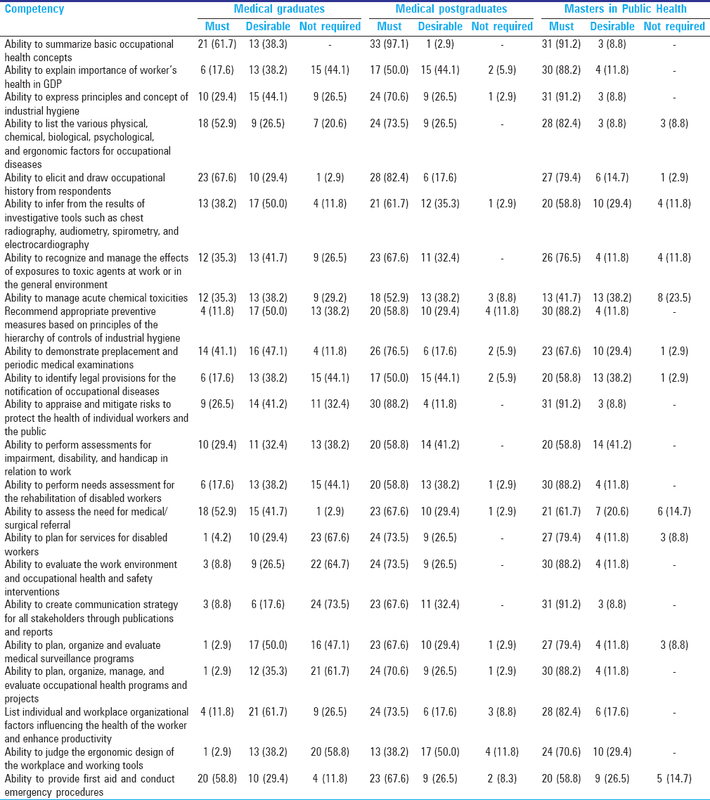 Through the extensive literature search, 23 competencies were identified for occupational health practitioners [Table 1]. [Table 1] also depicts the stakeholders' opinion about the competencies of occupational health that a medical graduate, medical postgraduate, and MPH graduate should possess. It can be observed that according to stakeholders, five competencies were a "must", nine were "desirable," and nine were "not required" by a medical graduate. The "must possess" competencies included the ability to summarize basic occupational health concepts, list the various physical, chemical, biological, psychological, and ergonomic factors for occupational diseases, elicit and draw occupational history from respondents, assess the need for medical/surgical referral, and provide first aid and conduct emergency procedures. According to the participants, the abilities to explain importance of a worker's health in Gross Domestic Product (GDP), identify legal provisions for notification of occupational diseases, perform needs assessment for rehabilitation of disabled workers, plan for services for disabled workers, evaluate the work environment and occupational health and safety interventions, create communication strategy for all stakeholders through publications and reports, plan, organize, manage, and evaluate occupational health programs and projects, and judge the ergonomic design of the workplace and working tools were not required by a medical graduate. Similarly, for a medical postgraduate it can be observed that according to stakeholders except the ability to judge the ergonomic design of the workplace and working tools, which is considered "desirable," all other competencies were considered a "must." Stakeholders' responses showed that an MPH graduate should possess all the enlisted 23 competencies. 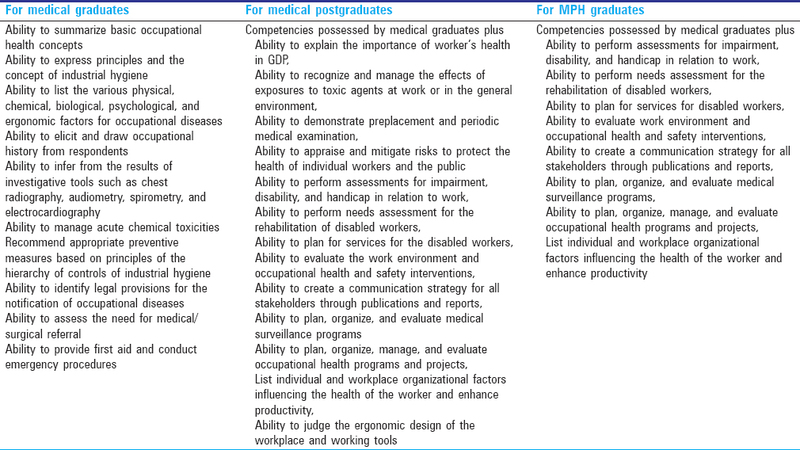 [Table 2] depicts the set of competencies to be possessed by medical graduates, medical postgraduates, and MPH graduates enlisted on the basis of stakeholders' responses and internal consultations between investigators on the competencies reported in the literature for each of the three abovementioned professionals. With the changing business scenario, employment and education profiles of labor, along with the newer occupations and emerging occupational health challenges, the role of occupational health professional has become more demanding. In order to respond to the rising burden of occupational diseases, trained and competent occupational health manpower is the need of the hour. However, on the flip side it is generally acknowledged that the human resources engaged in occupational health services are deficient in numbers as well as quality in most developing countries. In India the requirement of occupational health manpower is accomplished by medical graduates, community medicine specialists, and public health specialists working as industrial medical officers. These professionals by acquiring a diploma or a certificate in industrial health are eligible to work as industrial medical officers as per the law of the land. The job responsibilities of an industrial medical officer include identifying exposure at the workplace, detecting the deterioration in health early, and suggesting preventive action for controlling exposure. The community medicine experts working as industrial medical officers or specialists possess a postgraduate qualification in preventive and social medicine or community medicine and thus, in addition to medical graduates they are supposed to play a key role in occupational health research. In India, the MPH graduates practicing occupational health include both medical and nonmedical background professionals and thus, while on the one hand medical persons with MPH are entrusted with the detection and prevention of occupational diseases, the nonmedical persons with MPH play a role in social and vocational rehabilitations, disability limitation, and advocacy for adequate compensation among the victims of occupational diseases. The present study developed the framework of occupational health competencies for medical graduates, postgraduates, and MPH graduates. The findings of this study would help in revisiting the curriculum of occupational health courses in India to incorporate a competency-driven approach. The MCI, universities, and academic institutions running occupational health courses should revise the curriculum from a content-driven approach to a competence-driven approach for medical graduates, postgraduates, and MPH graduates. Thus, these educational reforms would facilitate strengthening of occupational health training in India. WHO. WHO Europe Occupational Health Nursing Curriculum. 2003. Available from: http://www.euro.who.int/__data/assets/pdf_file/0013/102271/e81556.pdf. [Last accessed on 2015 Apr 16]. WHO. Declaration on Occupational Health for All. Geneva: World Health Organization; 1994. p. 1-10. Zodpey SP, Negandhi H, Tiwari RR. Mapping "Occupational health" courses in India: A systematic review. Ind J Occup Environ Med 2009;13:135-40. Cloeren M, Gean C, Kesler D, Green-McKenzie J, Taylor M, Upfal M, et al. American College of Occupational and Environmental Medicine′s Occupational and Environmental Medicine Competencies--2014: ACOEM OEM Competencies Task ForceFNx01. J Occup Environ Med 2014;56:e21-40. SRC Commission. The Management of Occupational Health and Safety in Commonwealth Agencies- Competency-based Occupational Health and Safety Training. 2004. Available from: https://www.comcare.gov.au/__data/assets/pdf_file/0008/40112/Competency_based_occupational_health_and_safety_training_OHS_22_June_04.pdf. [Last accessed on 2015 Apr 16]. MacDonald E, Baranski B, Wilford J. Occupational Medicine in Europe: Scope and Competencies. Copenhagen: World Health Organization; 2000. p. 33-41. Kulkarni GK. Occupational health services-need for competency development. Indian J Occup Environ Med 2005;9:5-6. Frenk J, Chen L, Bhutta ZA, Cohen J, Crisp N, Evans T, et al. Health professionals for a new century: Transforming education to strengthen health systems in an interdependent world. Lancet 2010;376:1923-58. Stigler FL, Duvivier RJ, Weggemans M, Salzer HJ. Health professionals for the 21 st century: A students′ view. Lancet 2010;376:1877-8. Bhutta ZA, Chen L, Cohen J, Crisp N, Evans T, Fineberg H, et al. Education of health professionals for the 21 st century: A global independent Commission. Lancet 2010;375:1137-8.